Entoloma lochstetteri (syn Leptonia virescens, Entoloma virescens) is a sky-blue mushroom, ageing to greenish blue with ochreous tints. The conical cap is 0.8–2 in (2–5 cm) in diameter. The spores are pink. 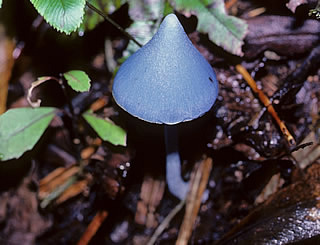 Entoloma lochstetteri is found, generally in autumn, under broad-leaved trees and podocarps (rare under nothofagus), in soil, moss, and on rotting wood. It grows in all three islands of New Zealand, particularly on the western coasts; and is also found in Australia.